Changes in the way we see swimming have had a twofold effect on the sport. In times past swimming came to be seen as essential. Lacking bathing facilities at home, boys in particular were encouraged to take a bar of soap down to the river and to bathe whilst having fun in the water. Shocking though the number of deaths from drowning are; 407 people died from drowning in 2011, of these, 47 were aged under 19, these numbers pail in comparison to the past; in 1878, 3659 souls were lost to water. Strenuous efforts were made to educate youngsters out of danger and reduce the number of deaths by drowning. Those who learn to swim in the shielding environment of the indoor heated pool gain a false sense of security as swimmers. It is always easy to get out of such a pool with its steps, ladders and low sides. Swimming in this setting does little to prepare one for misadventure. Accidents usually mean a sudden and unexpected entry into cold water, often with a current and possibly no obvious means of getting out. Add to this one’s being hampered by shoes and clothing and it’s not hard to see how many such mishaps end in tragedy. The real world environment comes as such a shock that panic often inhibits rational thinking. Tragically, statistics reveal that the vast majority of those who drowned were far from being capable swimmers. However things need not remain this way. Swimmers have become institutionalised at the public baths so it is no wonder that they find it hard to fend for themselves in the real world. 1) the crucial need to check water depth before diving or jumping in. 2) the difficulties in getting out of a flowing river. 3) currents and how to navigate them. 4) when the weather is especially cold, the experienced river swimmer will know just why to take extra care when walking near water. To prevent people swimming in open water deprives them of these benefits and might even do them more harm than good, and especially so when you consider that most children, having learnt to swim, never return to the baths but from then on and only swim again when on holiday. Outdoor swimming is much more fun and much more attractive. It seems ironic that outdoor swimming was once encouraged as a measure to reduce the number of drownings nationwide, whereas nowadays such swimming isdiscouraged for the very same reasons. Today our attitude towards swimming outdoors (we view open water with suspicion) means that swimmers are confined to the indoor pool. The fun of outdoor swimming has been replaced and much of the joy in swimming has been lost. 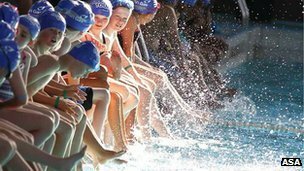 In consequence children have much less interest in swimming which affects their quality of life, their physical condition and life prospects should they ever meet with misfortune. Outdoor swimming at Hovden. Along the river Otra, there are many idyllic places to swim or sunbathe. Find your own spot, away from other people. Swimming is great at Hegni! On nice summer days, water temperatures in the lake of Hartevatn reach 20 °C and above, and the beach is teeming with people. Ice cream, lemonade, etc. are available from the kiosk. This superb recreational area has walking paths, play facilities, trampoline and a beach volleyball court, as well as boats and canoes for hire. The Hegni recreation area is located by the lake Hartevatn, approx. 1 km from the centre of Hovden. Here you find hiking paths, playground equipment, trampoline and a beach volleyball court, as well as a kiosk offering a cafeteria menu.